After demonizing Jews and Israelis, including citing Islamic sources that depict Jews negatively, and culminating with ongoing lies and libels that portray Jews as an immediate threat to Palestinian life and existence, the Palestinian Authority foment violence against Jews and Israelis, presenting it as legitimate and even heroic self-defense. 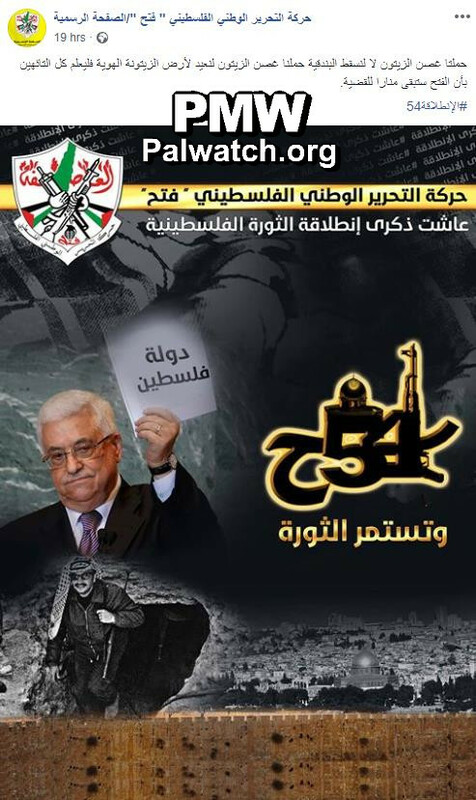 PA terror promotion takes many forms. 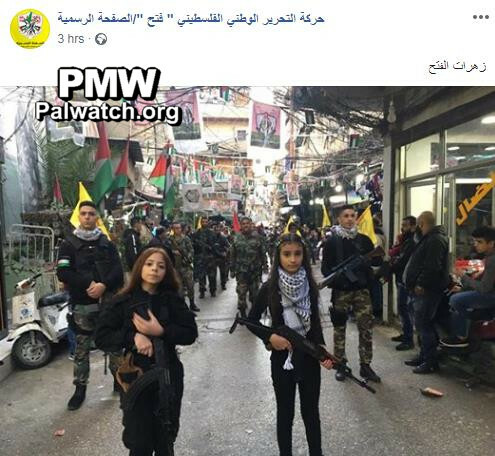 Nationalistically, the PA actively elevates violence as a valid and heroic means to achieve political goals, while religiously, fighting and killing Jews has been presented repeatedly by PA religious and academic leaders as Allah’s will. On the social level, Palestinian leaders and society honor even the most loathsome of murderers portraying them as heroes and role models: Dalal Mughrabi, who led a bus hijacking in which 37 were killed, has schools, summer camps, and many other events and places baring her name to immortalize and glorify her and her terror attack. 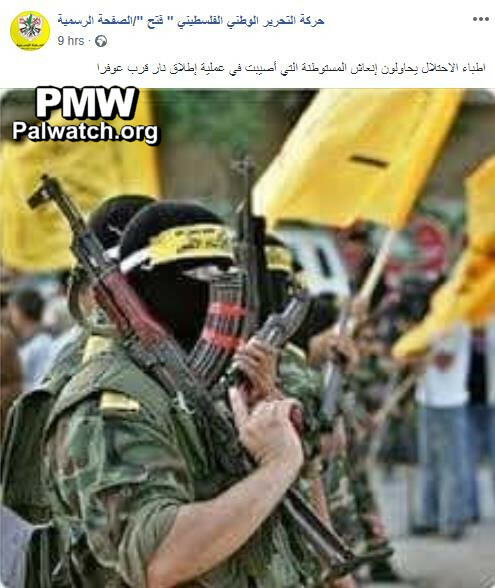 The success of the PA’s promotion of violence is readily evident: A majority of Palestinians support killing and suicide terror against civilian Jews and Israelis. A poll conducted after the murder of eight teenagers who were studying in a Jerusalem high school in 2008, found that 84% of Palestinians supported the murder [NY Times, March 19, 2008, citing the Palestinian Center for Policy and Survey Research]. 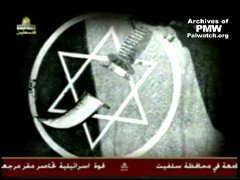 This violent image of a dagger being thrust into the Star of David has appeared hundreds of times in a video clip for children on PA TV, from 2001 – 2008. This section documents that “the rifle” and glorifying violence is central to PA discourse. Songs at Palestinian cultural events and broadcast on PA TV call for the “liberation of Palestine” and destruction of Israel through violence. The PA’s assurances expressed in international forums that it has abandoned violence and does not seek Israel’s destruction do not correspond to the messages expressed internally. To the world, the PA leaders say they have given up violence and terror. Among Palestinians, violence, symbolized by “the rifle,” continues to be embraced as a Palestinian ideal. 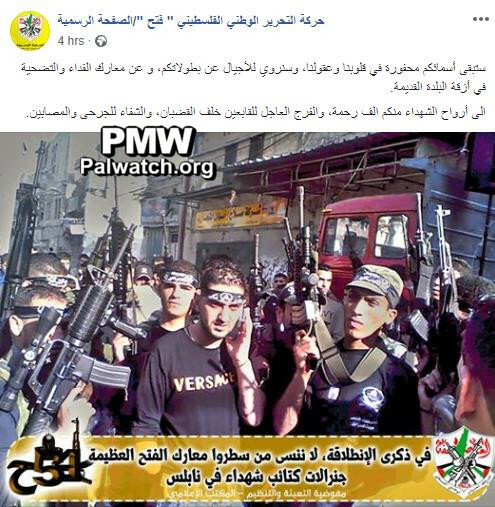 The image contains two pictures showing terrorist Ahmed Sanaqrah – who led a terror cell that planned to carry out attacks in Israel – with an assault rifle. "More than eight attempts to eliminate a young man less than 20 years old! Today, January 18 , is the 11th anniversary of the death as a Martyr of heroic commander Ahmed Sanaqrah. 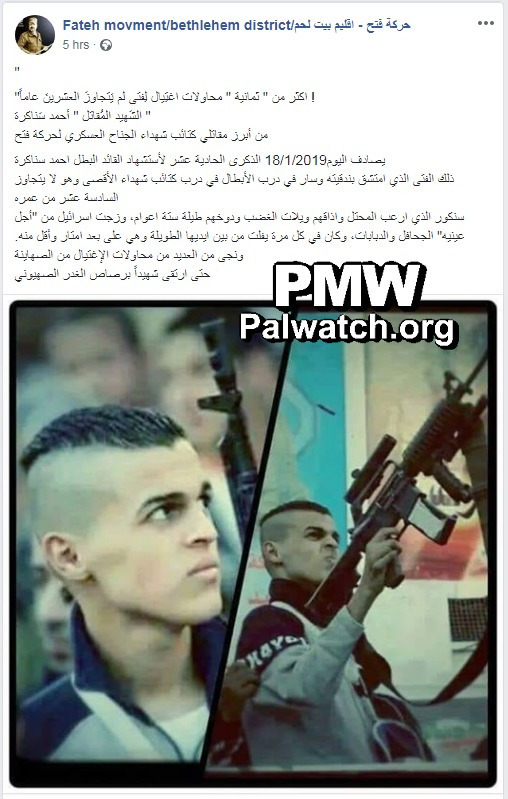 This young man – who took a rifle and followed the path of the heroes, the path of the Al-Aqsa Martyrs' Brigades – was not yet 16 years old. Sanaqrah frightened the occupier, fed it bitterness, and rattled it for six years." The image shows a group of armed men holding assault rifles. 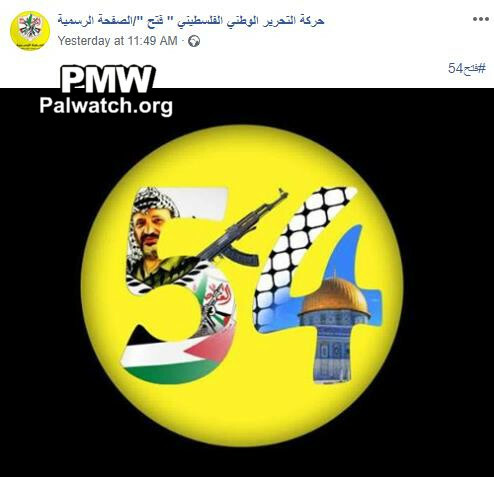 At the bottom left of the image is a logo for the 54th anniversary of “the Launch” (Intilaqa) of Fatah, which is commemorated on the anniversary of Fatah’s first attempted terror attack against Israel. 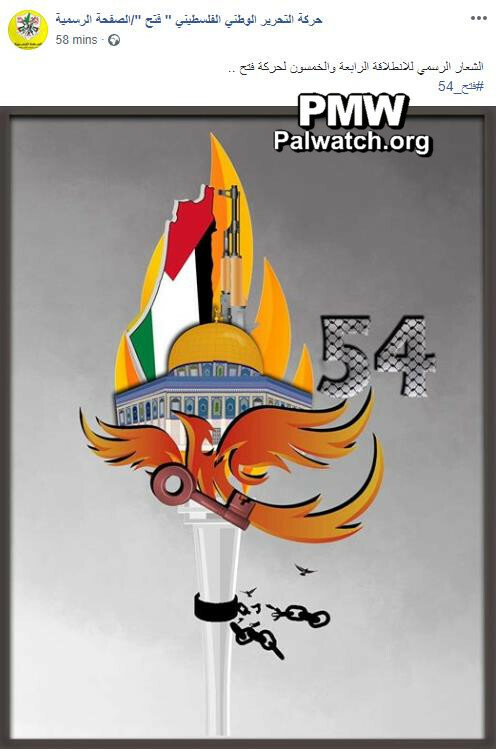 The image shows a logo for the 54th anniversary of “the Launch” (Intilaqa) of Fatah, which is commemorated on the anniversary of Fatah’s first attempted terror attack against Israel. 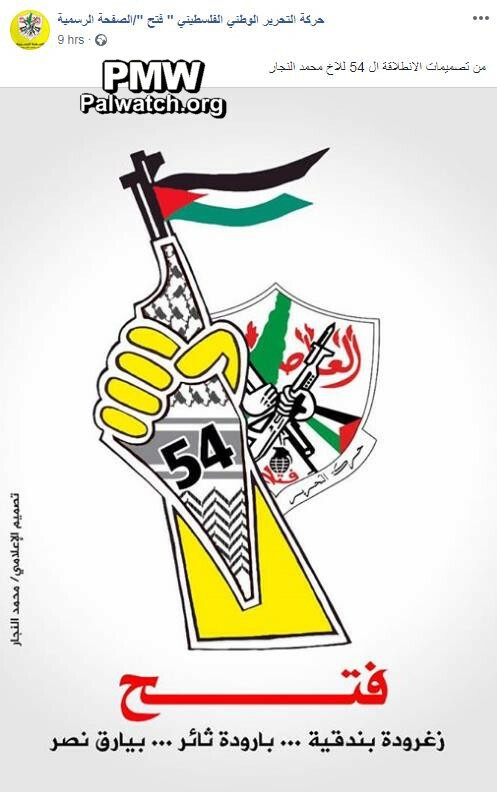 The logo consists of the number “54.” Inside the upper part of the “5” is a picture of former PLO and PA Chairman Yasser Arafat and below him an olive branch, with an assault rifle sticking out from the “5” next to the branch. 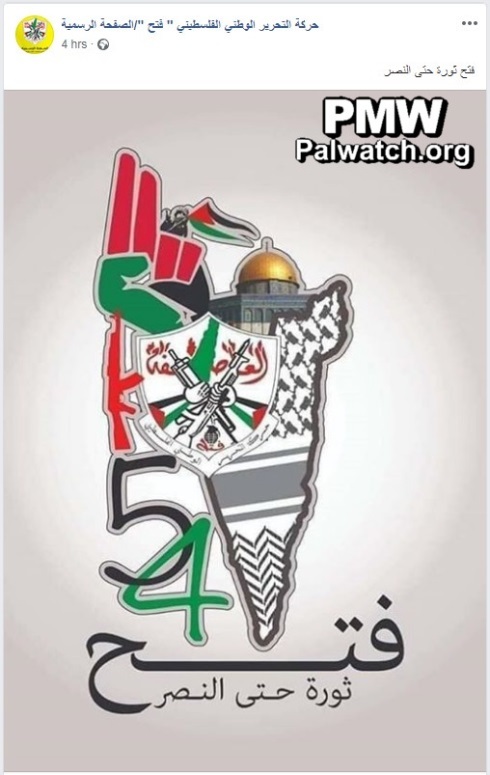 Inside the lower part of the “5” is the Fatah logo that includes a grenade, crossed rifles, and the PA map of “Palestine” that presents all of Israel as “Palestine” together with the PA areas, and a Palestinian flag. Inside the “4” are a keffiyeh (Arab headdress) pattern and the Dome of the Rock. 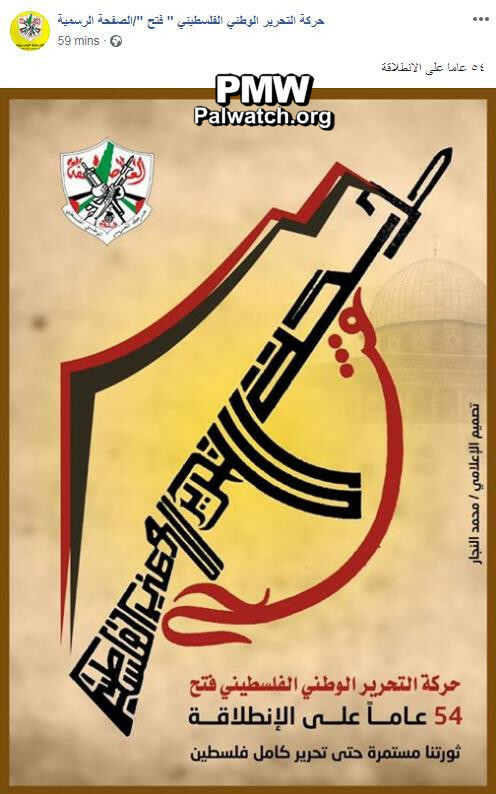 Posted text: "The official logo of the 54th anniversary of the Fatah Movement's Launch (i.e., Intilaqa, commemorated on the anniversary of Fatah's first attempted attack)"
Posted text: "We have not borne the olive branch in order to drop the rifle; we have borne the olive branch in order to return the identity to the land of the olive trees. 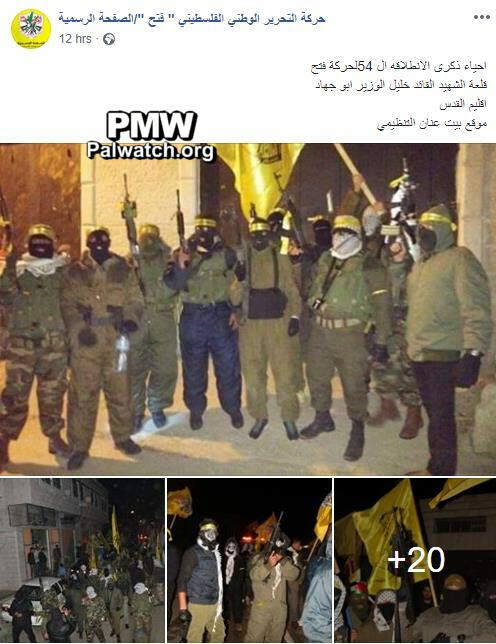 Let all those who are mistaken know that Fatah will continue to be a beacon for the [Palestinian] cause." 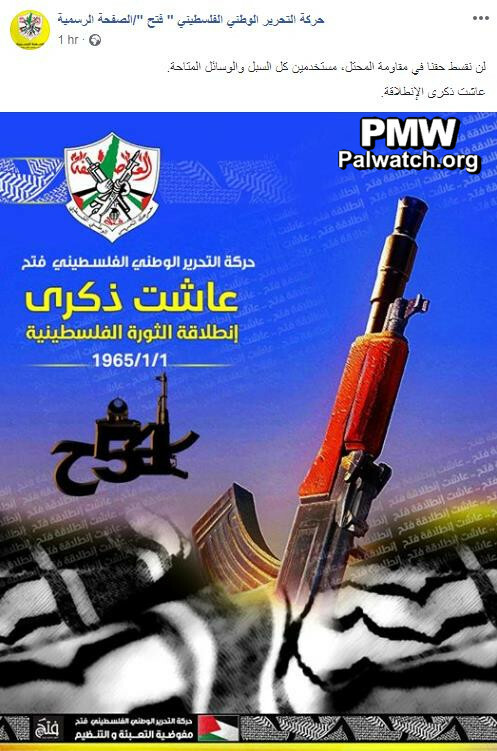 Long live the anniversary of the outbreak of the Palestinian revolution"
Text under logo: "The revolution continues"
Logo for Fatah anniversary commemorating its first terror attack features rifle: "Long live the anniversary of the outbreak of the Palestinian revolution"
"The 54th anniversary of Fatah's Launch (i.e., Intilaqa, the anniversary of Fatah's first attempted attack; see note below). 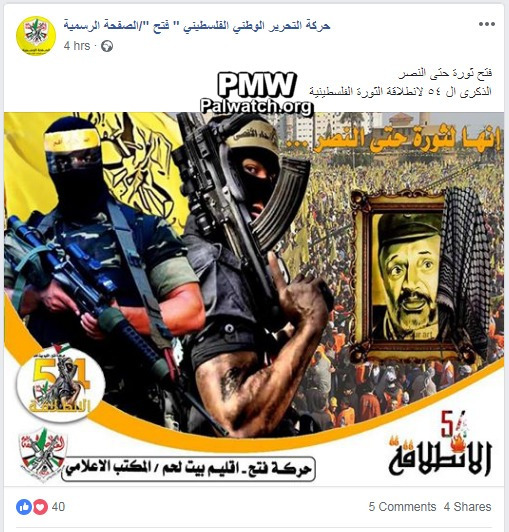 Mobilization and Organization Commission – Information Office"
The picture shows masked men in military uniforms with assault rifles and yellow Fatah headbands, some of them holding Fatah flags. Posted text: "The occupation's doctors are attempting to resuscitate the female settler who was wounded in the shooting operation (i.e., terror attack) next to Ofra." Ofra shooting attack – terrorists shot and wounded 7 Israelis - a pregnant woman, her husband, another man, and 4 teenagers - in a drive-by shooting attack next to Ofra, north of Jerusalem, on Dec. 9, 2018. The terrorists have not been apprehended as of Dec. 12, 2018. The image shows former PLO and PA Chairman Yasser Arafat with a group of people, most of them, including Arafat, are carrying assault rifles and wearing military uniforms. 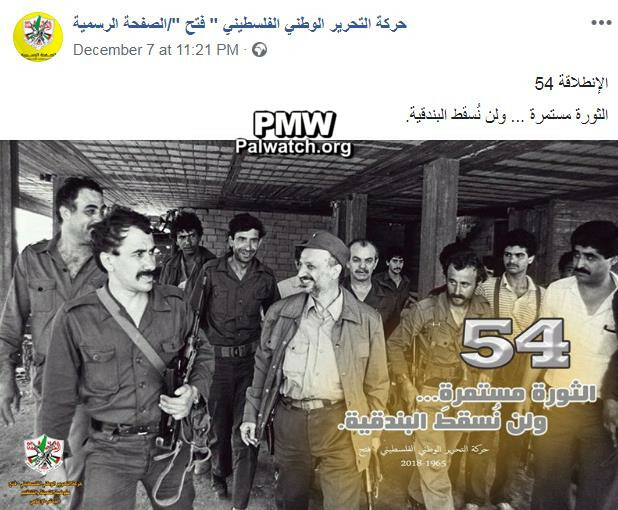 The image shows PA Chairman Mahmoud Abbas on the left and former PLO Chairman Yasser Arafat – founder of the PLO and Fatah terror organizations in the 1960s, and former chairman of the PA holding an assault rifle on the right. 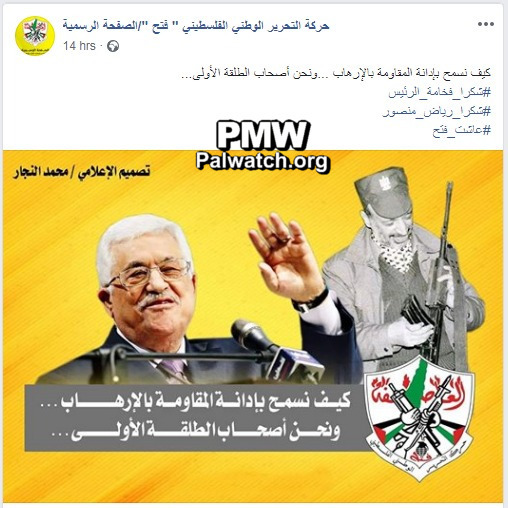 Below Arafat is the Fatah logo that includes a grenade, crossed rifles, and the PA map of “Palestine” that presents all of Israel as “Palestine” together with the PA areas. Text on image and in post: “How could we let the resistance be condemned as terror when we are the ones who fired the first bullet? 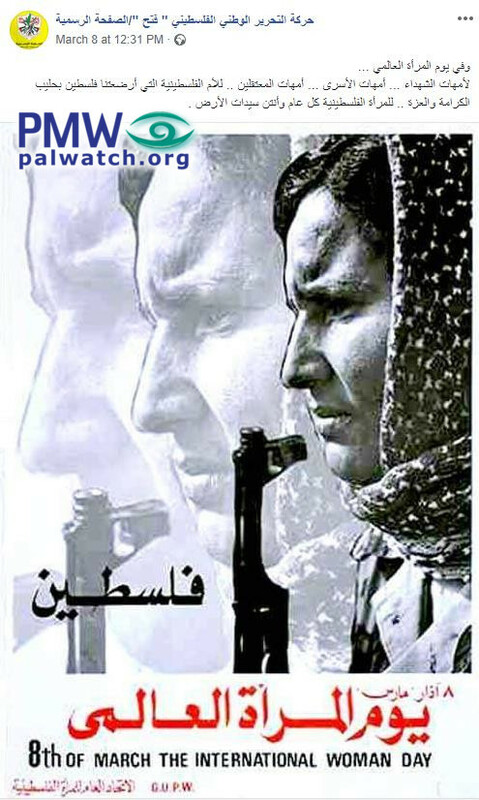 Fatah Central Committee member Abbas Zaki: “[UN] Resolution 3236 was passed which allows the Palestinian people to use all types of struggle – including the armed struggle … [Arafat] said to them: ‘‘I’ve come to you bearing an olive branch in one hand and a revolutionary’s gun in the other hand. Do not let the green branch fall from my hand.’’ He did not say: ‘‘[Let] the rifle [fall],’’ because the rifle will never fall, even today. We don't want to use the struggle, because we know that Israel is waiting for the opportunity to erase us from the land. 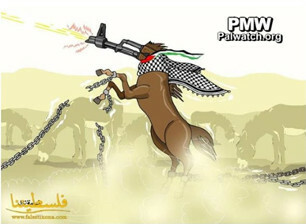 The cartoon shows a horse wearing a keffiyeh (Arab headdress) and a Palestinian flag around its neck, has in place of its head the barrel of an assault rifle that is actively shooting. Rearing up on its chained hind legs the horse breaks free of the chains on its front legs, while other horses or donkeys are seen grazing in the background. Barkan Industrial Zone Attack – 23-year-old Palestinian terrorist Ashraf Walid Suleiman Na’alwa shot and murdered 2 Israelis, Kim Levengrond-Yehezkel and Ziv Hajbi, in a factory in the Barkan Industrial Zone near Ariel on Oct. 7, 2018. 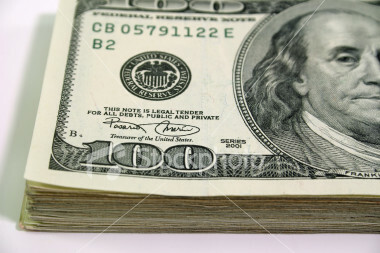 Na'alwa fled the scene and has not yet been apprehended as of this writing. Until this attack, the Barkan Industrial Zone had been an example of coexistence with Israelis and Palestinians working together.